For those of you who came in late on this one, I am in Tucson, Arizona, attending a conference on cataclysmic variables called Wild Stars in the Old West. It has been ten years since the last American CV conference, and five years since the last international CV conference. I wouldn't have missed this for the world. CVs are my thing. Not only that, but this conference's attendees list is a literal who's who of the CV research world. I am having a ball. Writing all about it has been a pleasure too, even if I have to stay up well past midnight local time to get it done. 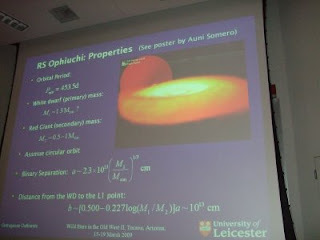 Day three featured talks on Magnetic CVs, Accretion Disks and Symbiotic Variables. The morning session began with Kent Honeycutt showing results of time-resolved spectroscopy of He I and H-alpha lines in BZ Cam. He showed some slick animations that illustrate wind events in the system. Axel Schwope's paper investigated the physics of hard x-ray emitting shocks in Polars using the XMM-Newton satellite. I also learned some new acronyms in common use in Polar research. LARPs, HARPs and PREPs. Low accretion rate polars, high accretion rate polars, and pre-polars respectively. You really have to keep up with the acronyms around here or you won't have a clue what they are talking about! David Buckley gave an animated, and at times humorous talk on the Southern African Large Telescope (SALT) and its fantastic suite of instruments, capable of doing high signal to noise time resolved photometry, spectroscopy and polarimetry. He also gave some honest insight into the pressures and demands of launching a sophisticated instrument program like this and its affects on the stressed out astronomers. Polars were the prevailing topic in the morning sessions. Fred Walter showed results of nearly continuous coverage of EF Eri with the SMARTS telescopes since 2003, and an overview of the long term behavior of the system since the 1970's and 80's. Paul Mason explained how highly magnetic polars like AT UMa emit at radio wavelengths. It turns out that accretion disks may actually squash radio emission, so the lack of an accretion disk in polars allows radio waves to be detected from these CVs outside of an outburst. Domitilla de Martino summarized results form XMM-Newton observations of Intermediate Polars (IPs). She also pointed out some of the similarities between IPs and Polars. After lunch we delved into the hearts of magnetic CVs and accretion disks. The first talk described an exceptionally long Chandra observation of EX Hydra and all the science they were able to glean from such a high signal to noise X-ray spectrum. They were able to explore the emission lines formed in the accretion column as well as first time ever views of a broad component that represents photo-ionization of the accreting column. I think its amazing how these guys can glean so much science out of 140 hours of time on a space telescope. They were also able to tell the size of the accretion spot and the height of the shock area. All this from an x-ray spectrum! Chris Mauche reported on a multi-wavelength campaign on the amazing star AE Aquarii. The combined radio, optical, UV, x-ray and gamma-ray results were presented eloquently. Chris is an excellent speaker and a brilliant astronomer. Knox Long described in detail his observations of the structure and source of winds in cataclysmic variables. The end result being, our current understanding is just about right. The talk that generated the most interest and discussion day three was Graham Wynn's talk on RS Ophiuchi and CVs with massive white dwarfs, giant secondaries and massive accretion disks. He had six movies running at once, a conference record, demonstrating the fact that no matter what the rate of accretion, a disk was formed from the secondary wind. He then suggested some unique solutions to dramatic outbursts RS Oph and objects like it. Big red secondaries and binaries with long periods remained the objects of interest for the last two talks on symbiotic variables. These interacting binaries present their own challenges to astronomers trying to understand binary evolution. 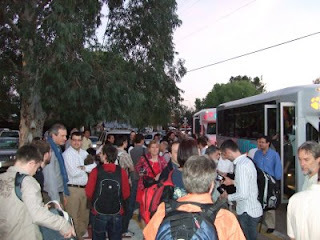 After the sessions were over we all piled into four buses and rode to dinner at a western steak house in Tucson. It was a fitting scene for a conference about wild stars in the old west. 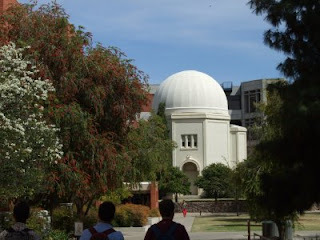 13 hours after heading to the observatory I found myself walking back to the hotel in the crisp dry evening desert air. I woke up the next day with vague recollections of a dream about Willie Nelson (or was that Steve Howell?) and supernovae.